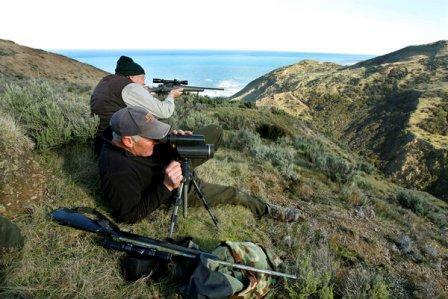 New Zealand is a big game hunters paradise! Our 12 different big game animals were introduced in the late 1800s/early 1900s and thrived in our abundant lush environment. With no natural predators animal populations grow quickly and can be managed for trophy hunting effectively. There is no government imposed big game hunting season so we hunt from February until July for most big game animals. Between the North and South Island we have 10 different hunting locations we can utilize for our clients, both high fenced and free ranging. 20,000 acres of which are private land which we have long term leases on or privately own. This allows us the control to manage the game for quality trophies. We have many bow hunters on our estate each season and success is 100%. Animals attainable with bow are: Red Stag, Fallow, Sika, Rusa, Elk, Ram and Goat. We have many permanent ground blinds in high frequency areas where hunters will see a lot of game and have many opportunities at what ever trophy they are after. We also 'spot and stalk' and call in some animals. On our 5 day hunts you can expect to have many opportunities at the game you seek. Of course there is always our Hunt Guarantee: if you don't harvest the trophy you came for we will refund you the full trophy fee. Great family! Wonderful time. I know my kids; Alec and Victoria will never forget it. It has been... Great family! Wonderful time. I know my kids; Alec and Victoria will never forget it. It has been AWESOME. Hope to be back for Sika and Rusa. When I come back I hope to bring the tortillas and cilantro. Thanks to Ollie also, he’s a good friend and great help. Adrian and Wendy are fabulous. Thanks so much Brent.